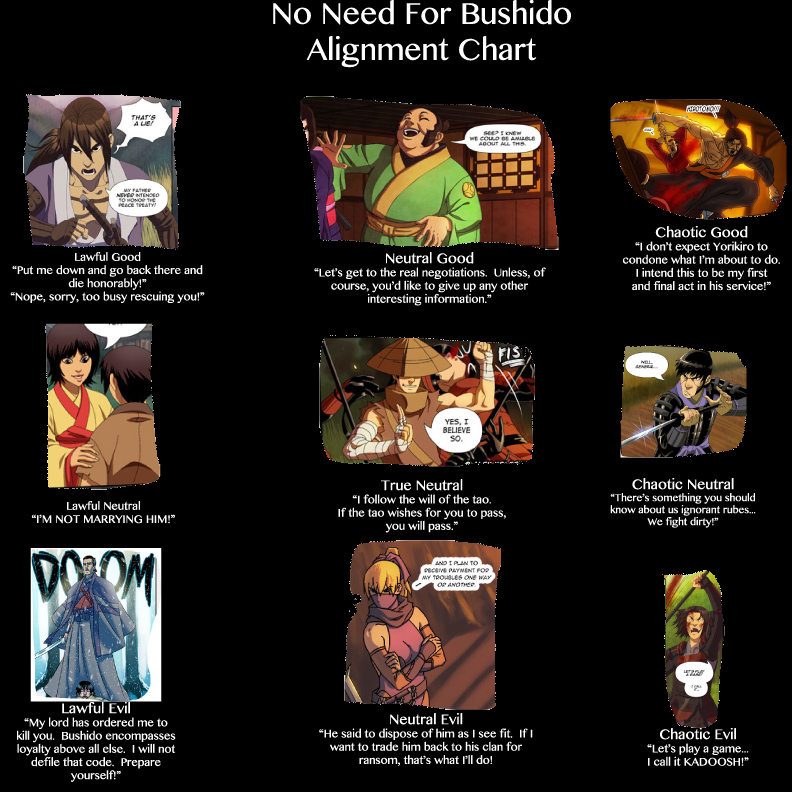 Reader Adam Bolander – ajbo(at)cox.net – has given provided a RP character alignment chart for the main Bushido cast! In light of the most recent page, Tadashi’s ‘evil’ alignment status may be in question, but without Adam’s knowing several of these characters’ internal motivations, I’m impressed with the result. Thank you. In addition, I think Daisuke would be much better off as Chaotic Neutral. I think it would be kinda hard to justify him as ‘chaotic evil.’ If he is, it’s not the same ‘chaotic evil’ as the Joker. I don’t know. Capital-G “Good” and capital-E “Evil” aren’t necessarily the same things as “good” and “bad”. In fact, I’ve found they rarely line up all that well. Capital-G “Good” people often do “bad” things. Capital-E “Evil” people often do “good” things. It’s one of the problems with trying to reduce the human condition to nine stereotypes. I think Tadashii is gunning for Ina’s spot right now.